Everything went well and I was pleased with the service. Recently I contacted Pure Water to exchange filters on our old Pura Whole House System that still works although this model no longer in production. I tried two other companies who stated they were not familiar with our system or did not have techs available who could help. Finally I called Pure Water, after discussion about our particular needs, an appointment was scheduled with technician Nick. Nick had not seen our model but reviewed instructions, replaced cartridges and tightened connections to correct leak. He was not intimidated because he was not familiar with our particular model and even stayed over time to explain how the system works. Leak was repaired, system works fine and water tastes great. I cannot say enough in appreciation for Nick and Pure Water for their dedication to customer service. Nick was great and a nice guy. Outstanding service. Nicolas was excellent. Did some extra things and made sure the system was up to speed. Look forward to seeing him next year! Jim was here a very long time and I got charged an additional hour of labor because of it. He also told me that Peter's Drilling overcharged for their services and hired unintelligent people. Then he proceeded to inform me that I needed to replace a lot of equipment. I asked for a quote. I was not contacted by the office with that quote. When I called for the quote, I was asked to call Austin. He gave me ballpark numbers over the phone and again I insisted that I need the quotes in writing. He told me to Google a piece of equipment that he claims needs to be replaced. At that point I was terribly frustrated and told him I do not know how to spell the word. He accused me of being "mean" and said he would be mean too. I hung up. Some service. I have had my system for over 6 years now and it is still current and working fantastically! Nic was very helpful and serviced our system in no time and gave us a few tips to make it more efficient to boot! Jim has always been courteous, professional, friendly and gets the job done right. They did a great job and keep me informed on what they were doing. After waiting a month for an appointment, no one showed up. Guess we'll have to learn how to service our own system And Austin sounded so nice on the phone . . . The PureWater crew is very easy to work with, and always polite, clear, and helpful. Kristina made adjustments to accommodate my schedule, while Jim and Steve arrived on time and worked steadily at installing the system, both the principal filtration one for the whole house and the reverse osmosis one under the kitchen sink. I couldn't be happier with the service, the responsiveness, and the end result. I always get good quality information from Christina and her crew. I never had a bad phone call or experience when working with them. Steven I believe his name was came out to service the equipment and was quick respectful and even answered all of my questions. This is the real A TEAM!.I always get good quality information from Christina and her crew. I never had a bad phone call or experience when working with them. Steven I believe his name was came out to service the equipment and was quick respectful and even answered all of my questions. This is the real A TEAM!. Jim C has a 5-Star rating and leads the company in total reviews, making this pro a ReviewBuzz Rockstar! I am from the Sacramento area and have been working in the water treatment industry for over 30 years. I enjoy spending time with my family, working on different projects and going to concerts and special events. Jim and Kristina were very helpful in getting our system back up and working efficiently. Jim explained what we could do to help prevent some of the systems issues from happening again.. Thanks for your help..
Kristina has a great sense of humor, Jim laughs a lot, and I couldn't be happier with their service. Jim spent plenty of time "fixing" my soft water system, while taking time to answer my questions, and explain what, and why he was doing, to get it "up to snuff". I will stay with them, for my yearly maintenance appointment, as I appreciate their professional approach and attitude to keeping my water clean and tasteful-----. Outstanding service. Jim has been servicing our home for 15 years!!! Great service from office and from Jim the service man. Would highly recommend Pure Water. Jim C is the greatest, he was fast and efficient. He explained what he was doing. He got in and made sure my system was in top shape! Thanks Pure Soft and thanks Jim! I'VE been with the company for several years. I receive a call every year to let me know its time for service. They send Jim out to service our unit . Jim's a great guy, he lets us know everything going on with the water. Great service ! Its a good feeling to have great water. THANK YOU PURE WATER ! We have had a Pure Water whole house water purification system for several years now. The only maintenance that we have needed is the annual maintenance visit that Jim makes to replace filters and check the overall performance and health of the system. The visit is scheduled in advance by Christine and is professionally performed by Jim who very thoroughly explains his findings and what he is doing. I have always enjoyed my interaction with Christine and Jim and would recommend Pure Water to anyone who would ask. Keep up the good work. I've been a customer of Pure Water for a number of years now and I wouldn't let anyone but Jim touch my system. I also had the privilege to meet with Austin last year in reference to replacing my old system based on inspection by Jim. My wife and I concurred with their findings. Jim installed the system on the day he said he would be here and all went very well. We are very pleased with the new system. As for dealing with the office. You'll not find a more pleasing and kind person than Kristina. She makes sure that appointments are met and if Jim can't make it for some reason, Kristina will make sure that another appointment will met our needs. I would highly recommend Pure Water as the place to go for any and all of your water system problems. Jim just has a great manner and will be hard to replace. 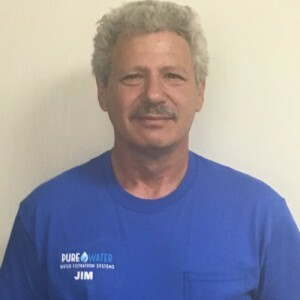 Jim C. has been a dutiful and consistent representative in servicing for Pure Water. He has serviced our system for many years and I look forward to him servicing our system. I was satisfied with this group of knowledgeable people. I scheduled my water testing. Austin was accommodating with his time to meet with my husband and I. With the holidays coming up, they were able to schedule an install before the holidays and 2 days after the testing. Everyone who helped me was wonderful. Super polite and friendly. Highly recommended. Jim has been servicing our water system since we bought our house 12 years ago and his service has always been great. We just replaced our antiquated system. Something must not have seated quite perfectly - when he found out about it, he came at the end of his already-scheduled day to make sure it was taken care of ASAP. It's nice to work with folks who always do the right thing by their customers! Fantastic group and Jim is the best. They are always so polite and friendly and.....always do as they promise! Highly recommend them. Kristina was friendly called ahead to let me know Jim was on his way. Jim showed up on time at 830 am as promised. He worked systematically and efficiently to find to source of the obstruction in my filter system. I had a million questions and he answered them all while continuing to work. When he left, my water pressure was back to normal and the water in my home was clear again.